Circuits and Equipment. solar source circuit, solar output circuit, inverter output circuit, and storage battery circuit conductors and equipment shall be protected in accordance with the requirements of Article 240. Protection devices for solar source circuits and PV output circuits shall be in accordance with the requirements of 690.9(B) through (E). Circuits, either ac or dc, connected to current-limited supplies (e.g., solar modules, ac output of utility-interactive inverters), and also connected to sources having significantly higher current availability (e.g., parallel strings of modules, utility power), shall be protected at the source from overcurrent. 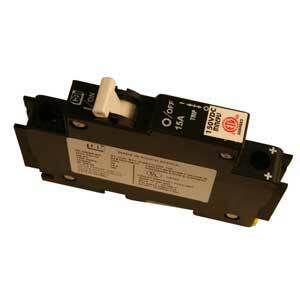 MidNite’s breakers are rated to break the full rated load at the rated voltage repeatedly, with NO DAMAGE. Always use a properly sized breaker for disconnecting. MNEPV breakers are the same as CBI QY breakers except the standard used is inadequate for the solar industry. MidNite breakers have been evaluated by ETL to 150VDC and are listed for US and Canada. All of the NRTL listings still apply. Breakers ordered under the CBI part numbering system will not be listed for 150VDC and in many cases are not suitable for the solar industry. 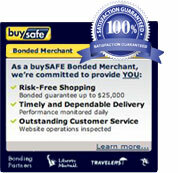 150VDC ETL listed in the US and Canada. 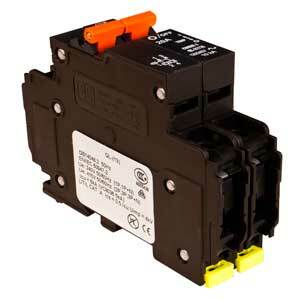 These breakers fit MidNite MNPV and OutBack combiners. Use breakers for arrays with maximum voltage of 300 or less 200 - 250 VDC charge controllers. 20/50 Amp 300 VDC 4 Pole Din Rail Mount Breaker. Width (inches) 2"
The fuse holder and fuses listed here fit MidNite MNPV and OutBack FLEXPV combiners and other 600 VDC solar combiners but do NOT fit Soladeck combiners. 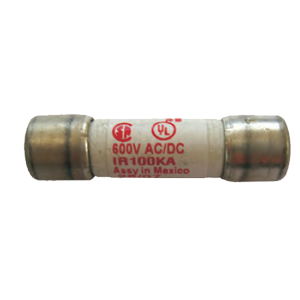 These UL listed fuses are used in many grid tied high voltage residential and commercial systems. DIN rail mount breakers are hydraulic-magnetic type and are not affected by high ambient temperatures. 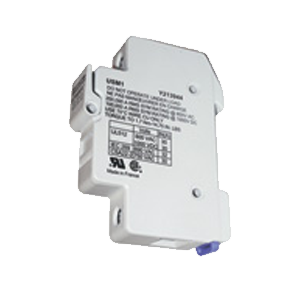 * Approved for maximum VOC of 15O VDC by ETL for PV array applications only. Fuse holders are DIN rail mount with #8 AWG set-screw type compression terminals. Touch-safe design and not rated for load make or load break usage. Maximum of eight fuse holders in one PSPV enclosure. 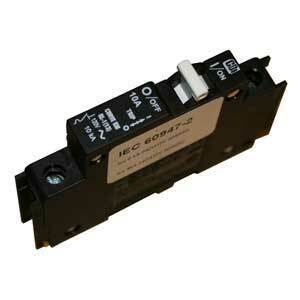 Used for adding more wire terminations or for isolating multiple positive/negative circuits. All TBB models have three #1/0 to 14 AWG and eight #6 to 14 AWG screw type compression terminals, which means no ring lugs are required. 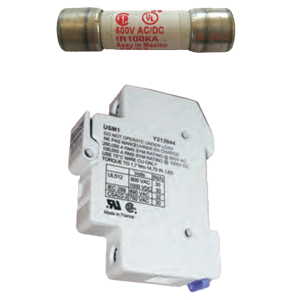 Available with black, white, red, blue and brown insulators. 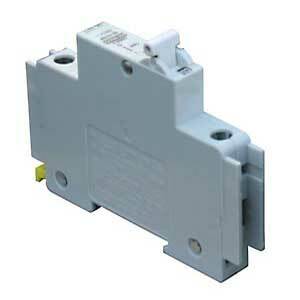 All required TBBs are included with the AC Input-Output-Bypass Assemblies. 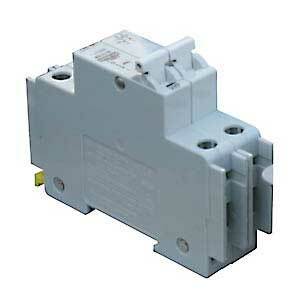 Circuit breakers and fuses are called over-current protection equipment because they do exactly that. Located in combiners, main breaker panels, subpanels and occasionally sometimes inside inverters they protect the house wiring from overloads which can be a fire hazard. A circuit or wire overload occurs when the load placed on the circuit is greater than the rating of the overcurrent breaker or fuse. A direct short is when the hot and neutral wires are either directly or in a roundabout way touching. A ground fault is a short in which the hot wire touches a piece of metal or human that is grounded. 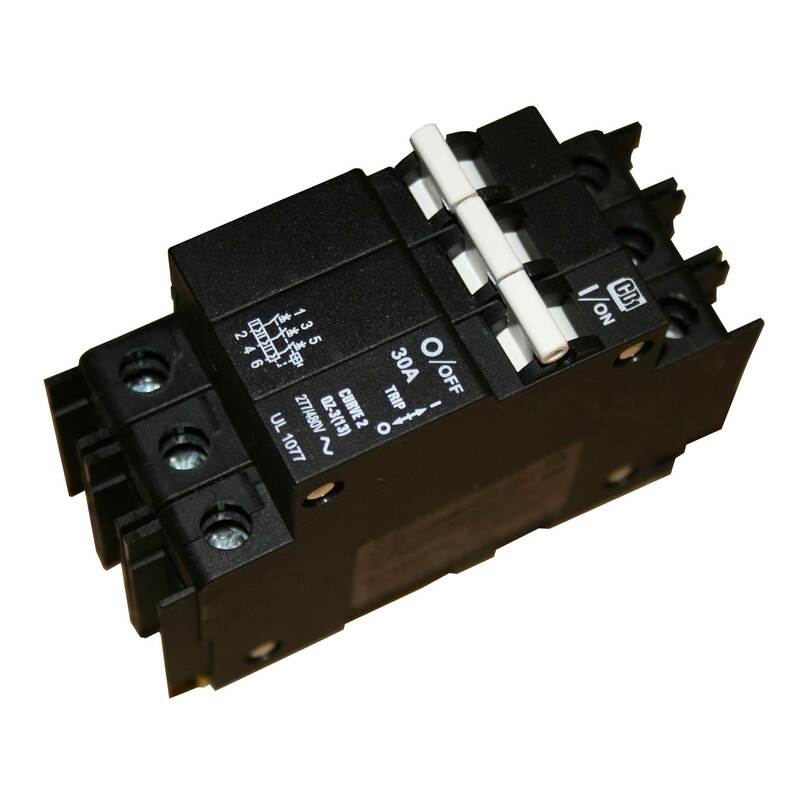 Circuit breakers are the most common use of overcurrent protection because they are safe and easy to disconnect or reset. 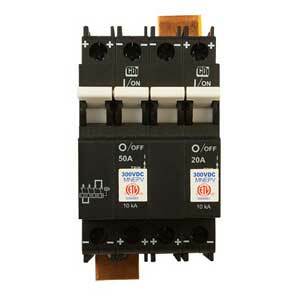 A circuit breaker acts in a similar fashion to a fuse in that it measures overcurrent in a circuit but instead of blowing the fuse it opens the circuit. Breakers are unique in that not only do they detect overcurrent in a circuit, they are designed to be ambient compensated. That is they are engineered to de-rate as the air around the breaker heats up. Example, a 20 amp breaker is sitting between two other breakers generating a great deal of heat, the 20 amp breaker may trip at 16 amps. 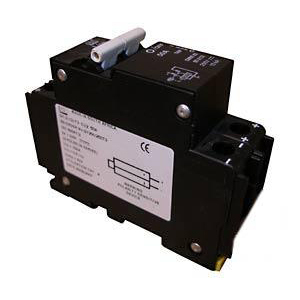 MidNite Solar breakers are unique and especially well-suited for PV systems because they are rated to break the full rated load at the rated voltage repeatedly, with NO DAMAGE. Single-pole breakers control the amps on loads that use only one leg of the incoming 240 volts AC. Double-pole breakers rated at 120/240 VAC control amps on both legs of the load. Double-pole breakers normally consist of two single-pole breakers with a shared handle and internal trip. On high voltage DC circuits single pole breakers are stack from two to four to achieve a safe and code compliant over-current protection.